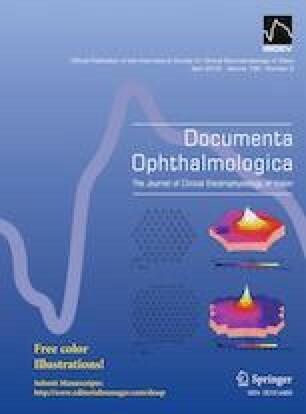 The purpose of this study was to compare electroretinographic (ERG) responses of preterm schoolchildren, with and without a history of retinopathy of prematurity (ROP) with those of full-term schoolchildren by using a portable ERG device (RETeval system). Twenty five prematurely born schoolchildren with a mean gestational age of 27 + 1/7w (range 23–30w) and a mean birth weight of 1030 g (range 580–1700 g) who were 6.9 ± 2.2 years old participated in the study (premature group). A further subdivision according to a history of ROP (ROP+ group) or its absence (ROP− group) was introduced. Twenty eight healthy full-term schoolchildren with an average age of 8.6 ± 1.9 years participated as the control group. 30-Hz flicker ERG responses were obtained, and implicit times and amplitudes were compared between the groups. 30-Hz flicker ERG implicit times showed a significant difference between all three groups of children. The mean value of the implicit time in the term group was 25.76 ± 0.9 ms, whereas in the preterm ROP + group it was 28.96 ± 1.0 ms and in the preterm ROP− group it was 26.87 ± 1.5 ms. 30-Hz flicker ERG amplitudes did not show significant difference between term children and children born prematurely with or without ROP. Prematurely born schoolchildren exhibit longer implicit time of the 30-Hz flicker ERG response compared to controls, suggesting a possible abnormality of the retinal cone system function. Under such circumstances, portable ERG device might be used clinically as a screening tool for retinal function evaluation in prematurely born children. This study was supported by the Slovenian Research Agency (P3-0333) and a research grant from Medical Centre Ljubljana. Manca Tekavčič Pompe and Maja Šuštar declare that they have no conflict of interest. Data generated during the course of the current study are available from the corresponding author on reasonable request. This study adhered to the tenets of the World Medical Association’s Declaration of Helsinki and was approved by the Ethics Committee of the Medical Faculty, University of Ljubljana, Slovenia (Number 151/08/14). Informed consent was obtained from all parents or caregivers of children included in the study.